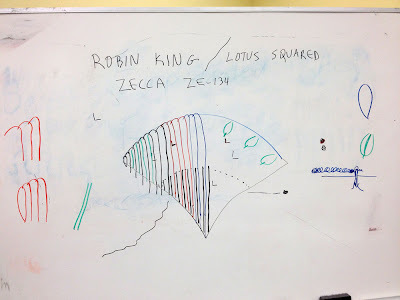 I had another fun charting job come my way. 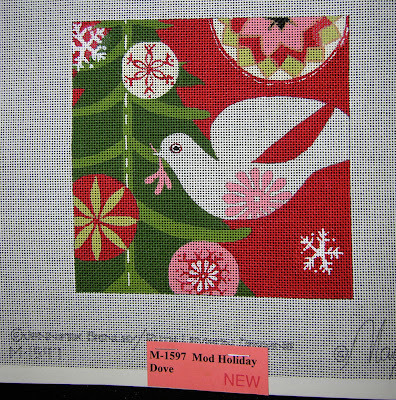 This time it was from Peggi at Tapestry Fair. 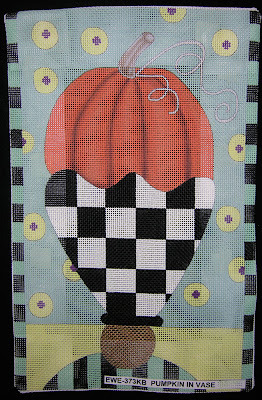 I met Peggi while attending the Phoenix TNNA Market this past January 2012. Nice lady. 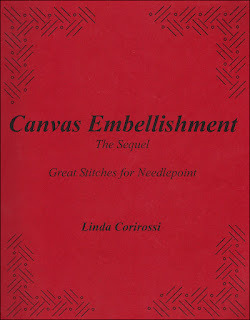 I know you are familiar with the Tapestry Fair line of canvases. Most recently, you have seen blogging by Jane from Chily Hollow about the Manuel Salas "Day of the Dead" canvas she is stitching; distributed by Tapestry Fair. Here's their website. 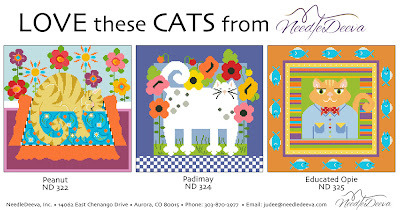 Take a look all of their wonderful designs. Peggi was needing me to chart some icons for the upcoming class being taught by Linda Corirossi called The Painted Elephant. Choose your colors, raid your jewelry box for bling, and join Linda Corirossi for a series of classes to "paint" your own elephant. 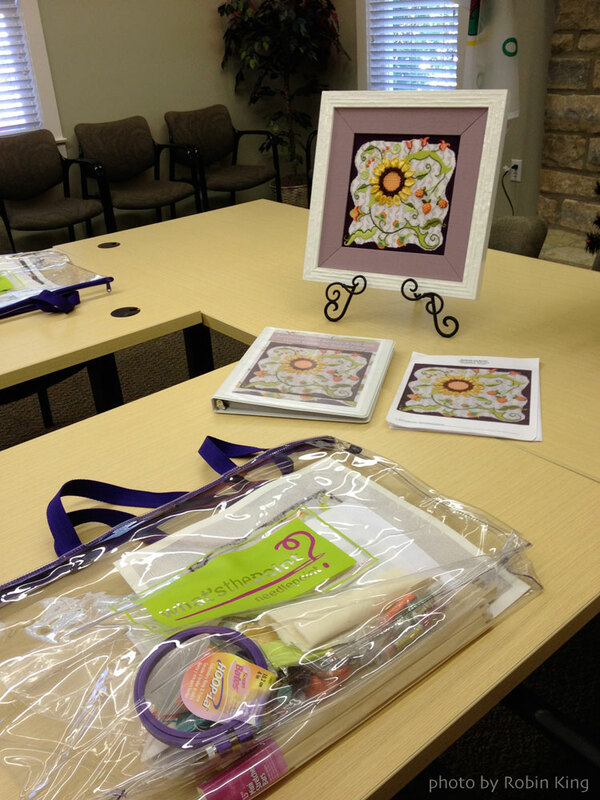 The class includes a line drawn canvas, stitch planning "map", and a stitch guide including picture graphs to decorate your elephant. With Linda's guidance, each elephant will be exotic and original. 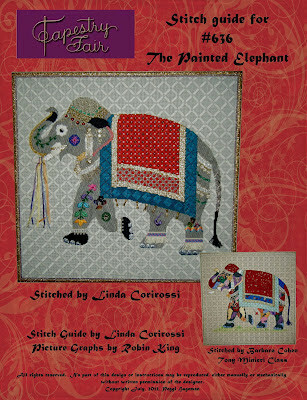 The first elephant class will be help October 19th, 20th and 21st at Family Arts Needlework in Phoenix, AZ. So, exactly what did I do? 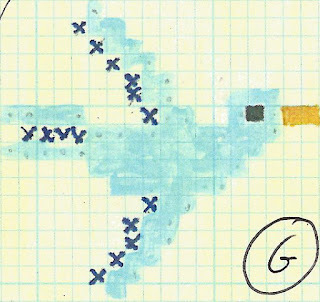 Peggi sent me several pages of graph paper with icons in colored squares. I made a graph grid in the computer, and then colored the boxes in the same sequence; creating these endearing icons. It was a new task to learn and was fun doing so. 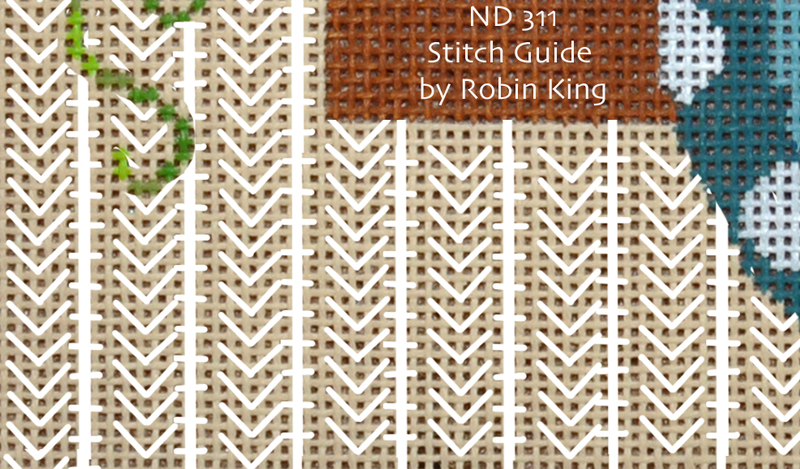 When I was finished, a 4-page PDF of the 27 icons/components was ready to become part of the stitch guide. I would love to take this class. 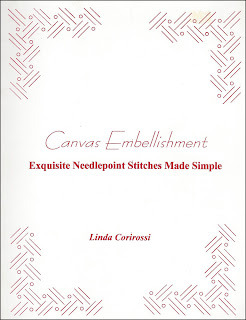 I have been a fan of Linda Corirossi for many years. I have both of her books. You have them, too... right? 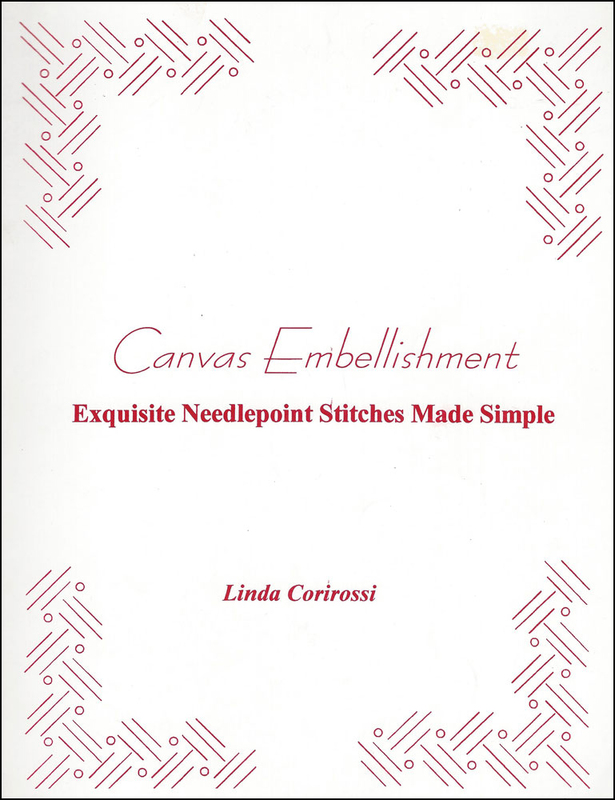 I use these books often when writing stitch guides as well as for my own personal stitching. Like I said, I would love to meet Linda. If any of you take the class, be sure to let us see your progress and hear about your experience. 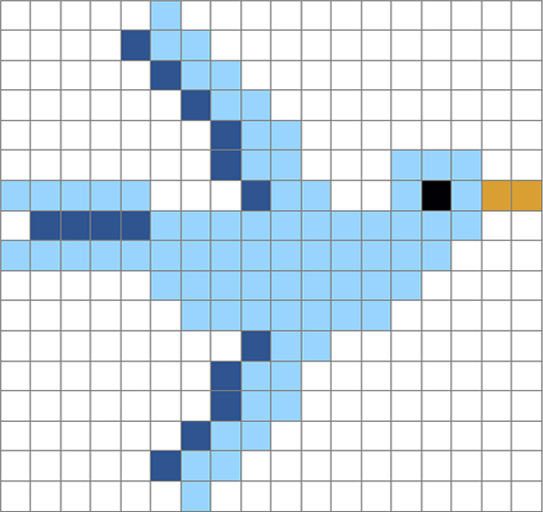 When you stitch the little bird, you can think of me. It's time to start talking about my next teaching piece, Flowers in a Vase (ND 311) by NeedleDeeva. I will be teaching this piece at The Bristly Thistle in Amelia Island, FL on the second day of my two-day visit. I have never been to Michele Herron's shop and am looking forward to it. Come see me October 12 and 13, 2012, if you are in the area. Flowers in a Vase is on 18 mesh and the canvas design measures 8" W x 8" H. For reference, it is the same size as Sunflower and Berries (ND309). It is my plan for this piece to have just as much fun: Silk Ribbon Embroidery, Stumpwork, Beads, composite stitches and Sparkles. So, with the deadline clock ticking, it is time to begin my stitching journey. First, was the dark brown area. What to do?... 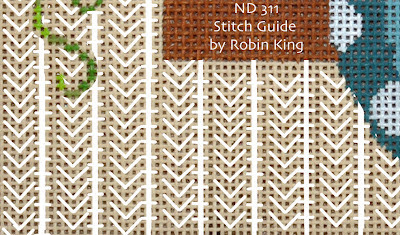 Well, nothing says "dark brown background area/it's not an important area/need an easy stitch" like Skip Tent. And, that's what I did. Love it especially when jumping over and around the flowers... it is so easy to compensate. Next was the Tan Border. Here's where I put my Photoshop skills to the test. What to do... what to do? First, I thought I might want a geometric/rounded design. 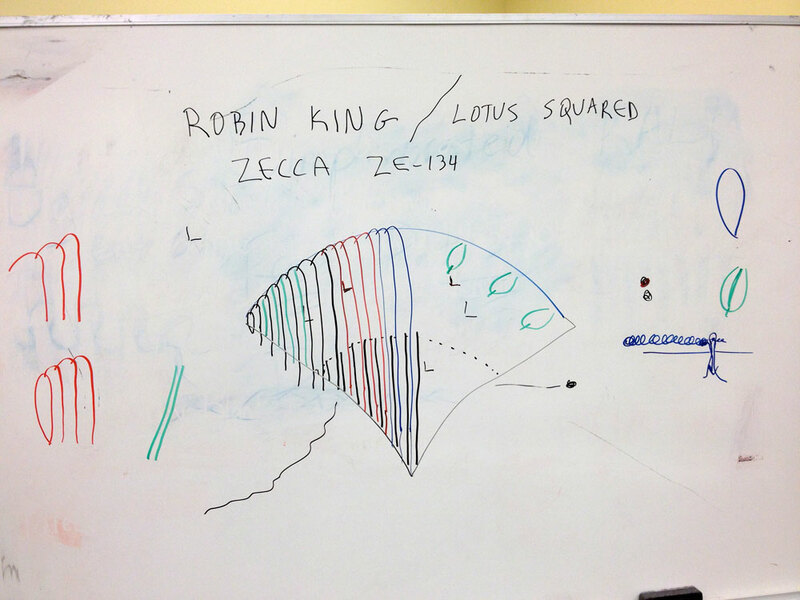 I had seen this one, and laid it out as a second layer; keeping the original document in tact. It looked OK so I began stitching. After a few stitches, I realized I was traveling down the wrong path. Too similar to the vase and flowers. I needed something different. I needed another stitch... something more linear. My inner voice was cheering me on. A linear design was certainly opposite to the geometric/rounded design. 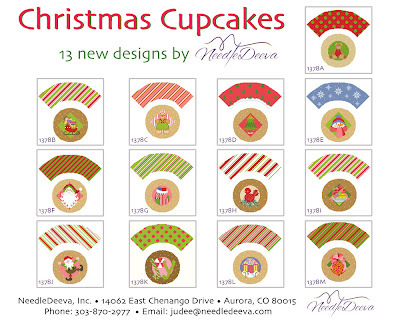 Again, in Photoshop, a new layer was selected and I began designing. (Oh, if only I could stitch as fast as I draw...) The white lines were selected to give me something to see, but actually the threads chosen do match the painted canvas. I was liking it, and again, began stitching. It did look better than the first geometric/round stitch... BUT... something was just not right. The linear design was "too busy." There was no place for my eyes to rest. Enter Basketweave to the rescue. What?!! Yes, by alternating the linear design with a Basketweave section, my eyes were able to rest... which made me appreciate the linear design even more. Problem solved. So, that's all to report as of now. Like I said, the deadline clock is ticking. Let me know what you think so far. 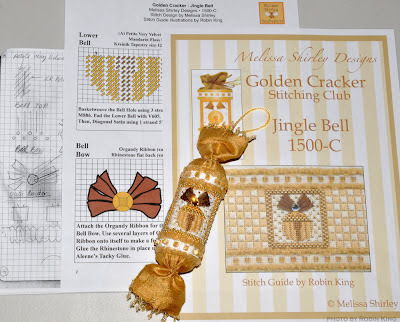 Have you heard about Melissa Shirley's Golden Crackers Stitching Club? It is her first retailer's stitching club featuring her 10 Golden Christmas Crackers, beautifully stitched by Melissa with stitch guides by Robin King. Hey... that's me! Several months ago, I received an email from Melissa Shirley asking if I would take her existing notes and write/ illustrate on the computer the stitch guides for each of her Golden Crackers. How fast do you think I said YES? She sent me my packet of information: her hand written notes with wonderful sketches and the stitched models... stitched by Melissa Shirley, her very self. 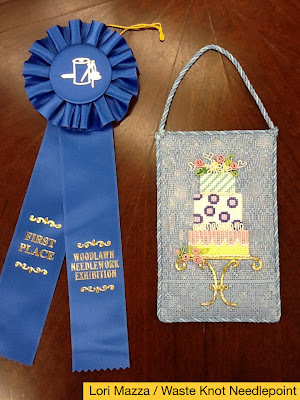 I bet you didn't know Melissa Shirley is also a very good needlepoint stitcher, too? Well, she is. 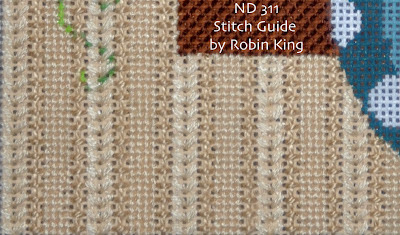 In fact, you can visit her website and download two PDFs of her Stitch Guides: Yellow Apple Stitch Guide and My Shimmery-Snowy Angel Stitch Guide. 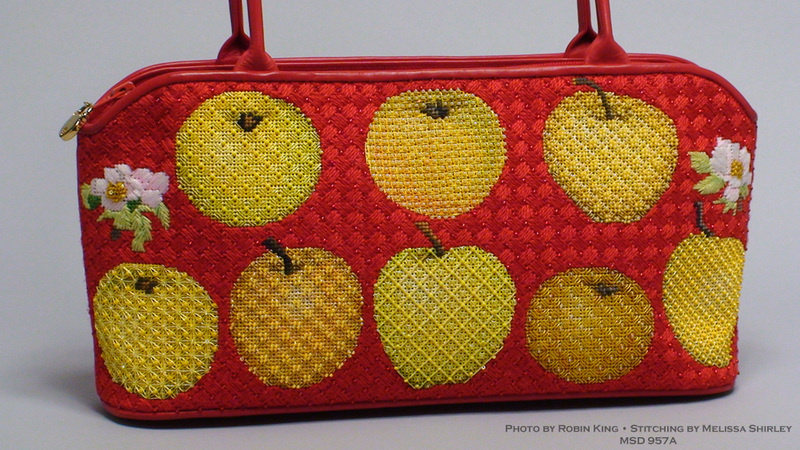 Side note: I had the pleasure of seeing the Yellow Apple Purse in person while filming/editing DVD #5 (Fancy Flowers). Look how stunning this purse is. 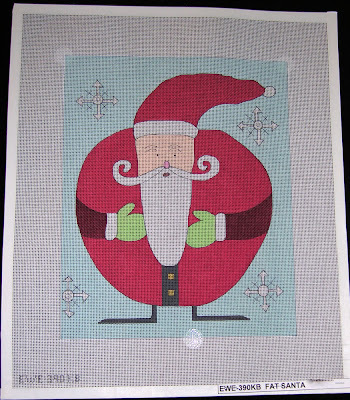 Stitch Guide by Wendy Harwood of Aristeia. Such a talented lady! She will be missed. 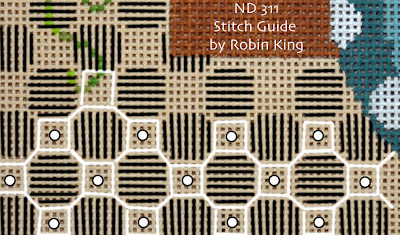 Whenever you combine a well-known designer who also stitches, you get some creative out-of-the-box techniques. Many of which were seen on each of these Golden Crackers. Believe me, I took notes! Seeing/studying her stitching gave me "permission" to stitch outside the box. Thanks, Melissa. You can sign up to stitch the Golden Cracker Stitching Club through any of the participating Retailers listed on Melissa's website. Here's the link. Check and see if your Local Needlepoint Shop wants to participate, too. 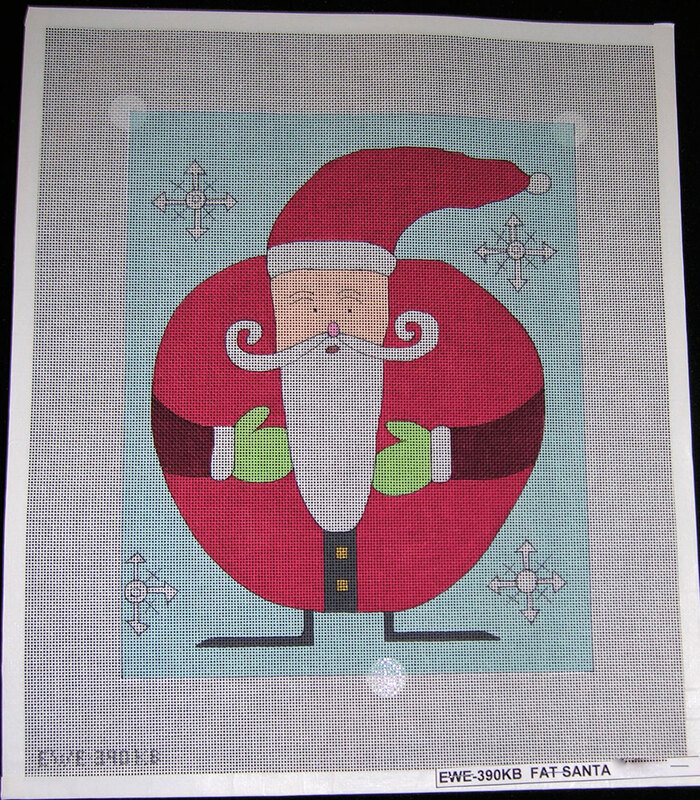 Oh, and all the special embellishments used by Melissa will be sent along with each canvas making your Cracker just as pretty and unique as hers. 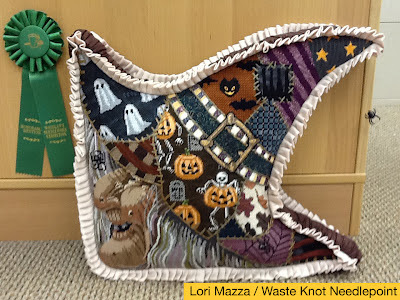 Waste Knot Needlepoint in Arlington, VA for sharing these photos. 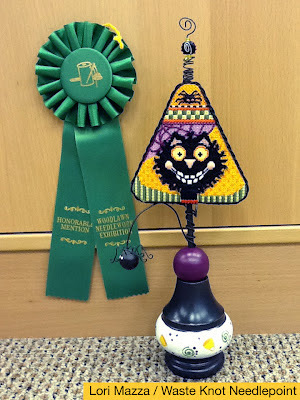 Katt Z. Witch class at TNNA. Since then, she has taken a few other classes of mine including the 3D Cake class (featuring DMC Memory Thread techniques) and the Fraidy Cat class (from the Creepy Characters by NeedleDeeva). 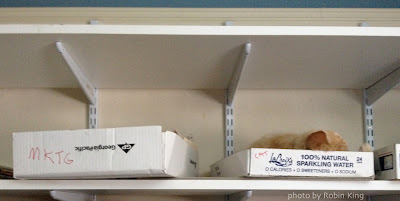 Longtime blog readers are probably familiar with both of these pieces, but for those new to the blog, here is a more direct link to review: 3D Cake and Creepy Characters. 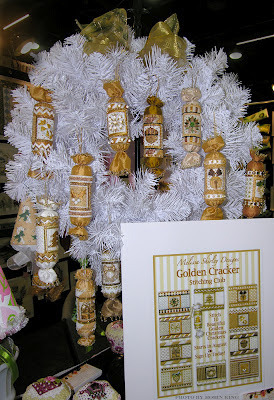 I recently saw Lori at TNNA/Columbus market and she showed me her photos w/ribbons from Woodlawn. How exciting. Here is a summary from Lori. 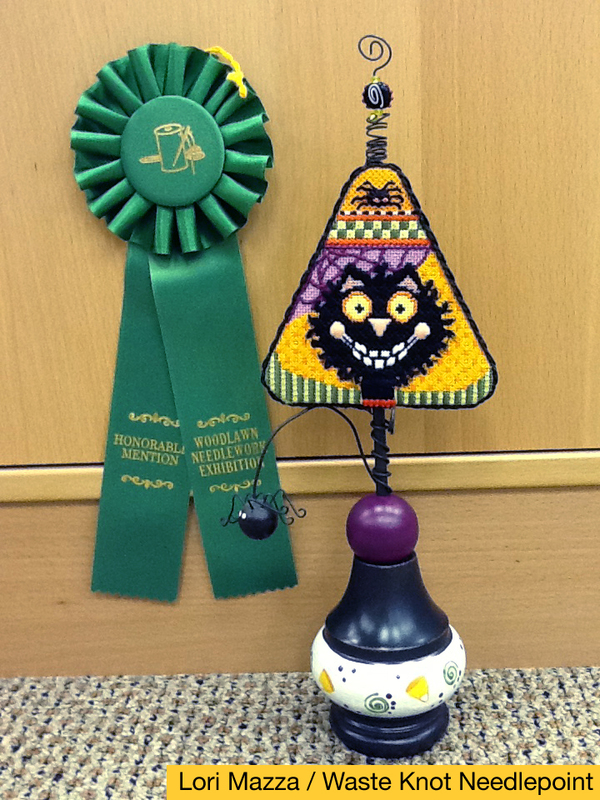 As a shop, we put in 31 pieces for our customers and received 16 ribbons out of 31 entries. Congratulations to Lori and all of her wonderful stitchers at Waste Knot Needlepoint. 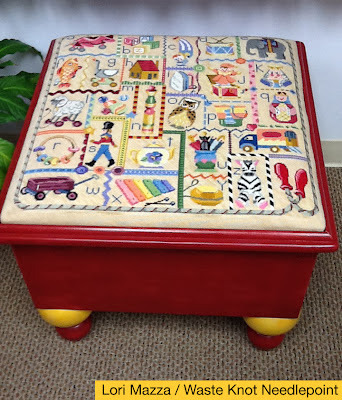 Love the wooden finishings on Fraidy Cat and the Toy Box? Those were done by Sharon Hall at Mountain Shadow Studio located in Denver, CO. Your needlepoint shop can send your work to them for finishing, too. Hooty Owl was also stitched by Lori and finished by Mountain Shadow Studio. Don't they make a handsome pair! Lori is certainly ready for Halloween. Seeing one's stitch guides come into reality... and winning ribbons... is so thrilling. 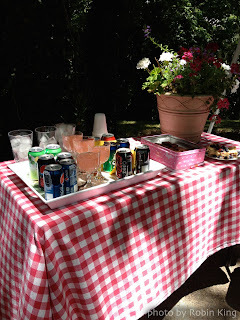 Thank you, Lori for sharing your work our blog readers. I have the Way-Back Machine waiting for you. 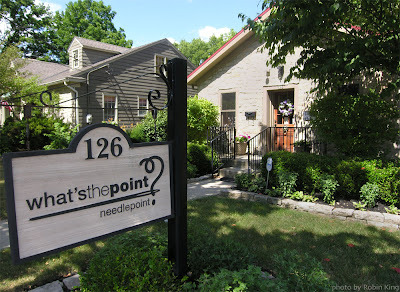 Let's continue my story from TNNA/Columbus and go to What's The Point? 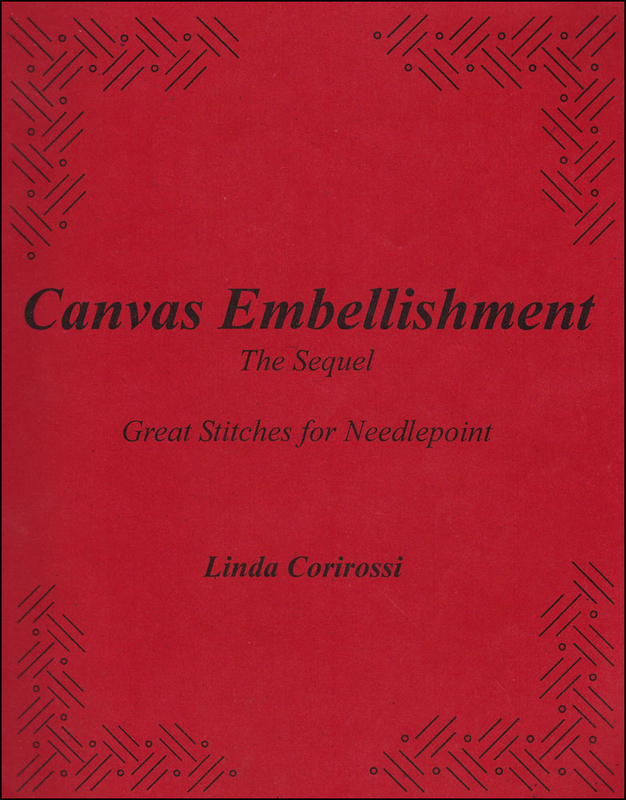 Needlepoint, shall we? I had been invited to teach the Sunflower and Berries canvas by NeedleDeeva (ND 309). Stumpwork, Beading, Silk Ribbon Embroidery, and composite stitches make this 8x8 design fun to stitch. 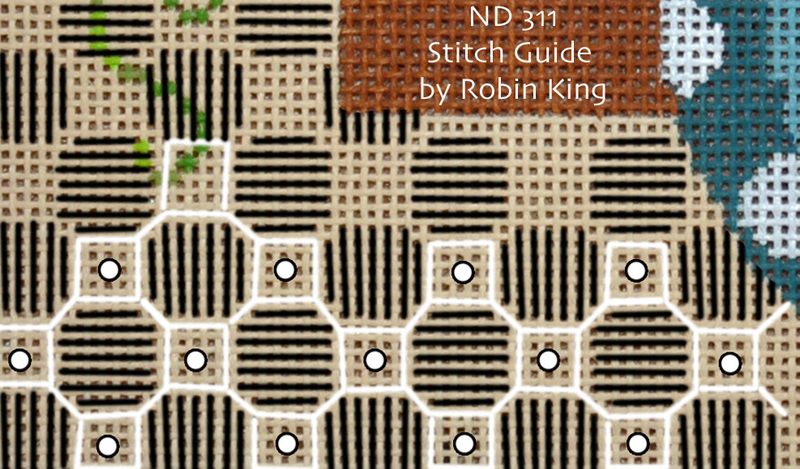 And, don't forget, the canvas comes with my stitch guide. Have you been to What's the Point? Needlepoint in downtown historic Dublin, Ohio? 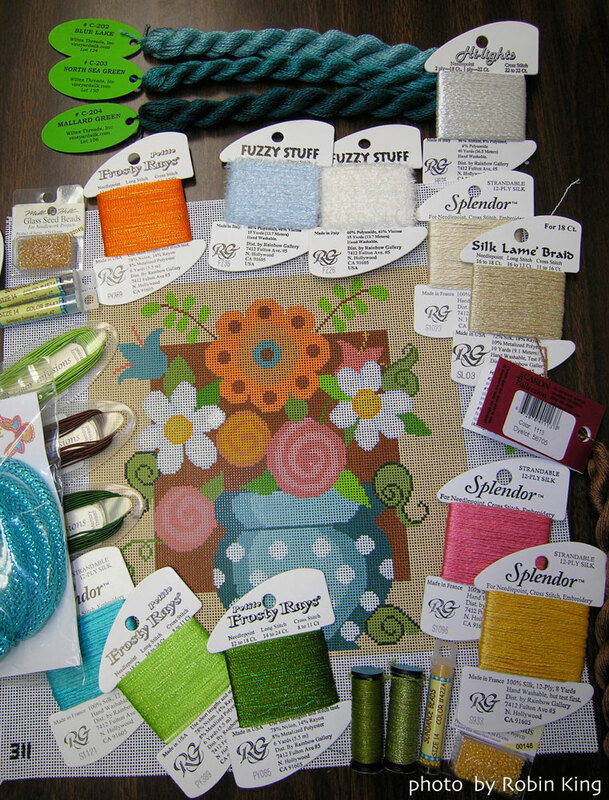 Located just outside of Columbus, their shop is filled with canvases, threads, accessories, and wonderment. Quaint, charming, and magical are the best words I can describe. 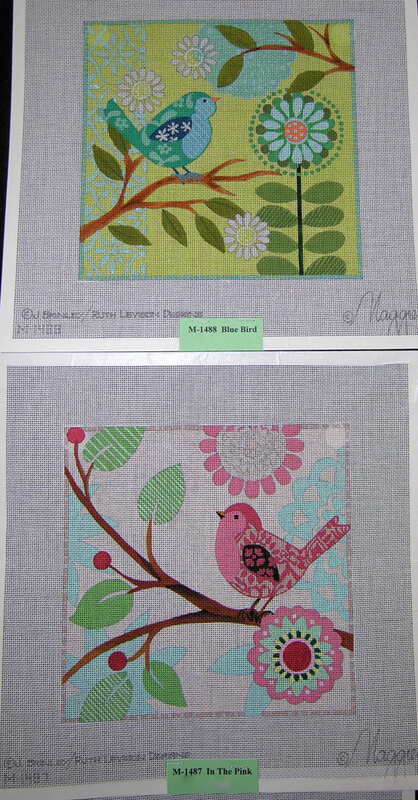 Lynn and Becky (owners) have a jewel of a needlepoint shop. They even have a nice employee named Kitty. Too cute! Class was held right across the street in the Dublin Chamber of Commerce conference room. Spacious, great lighting, comfortable chairs and a place to spread out... what else could you ask for? Most of the women attending the class were local to the Columbus area, but there were two ladies who drove down from Cleveland to take the class. Too cool. 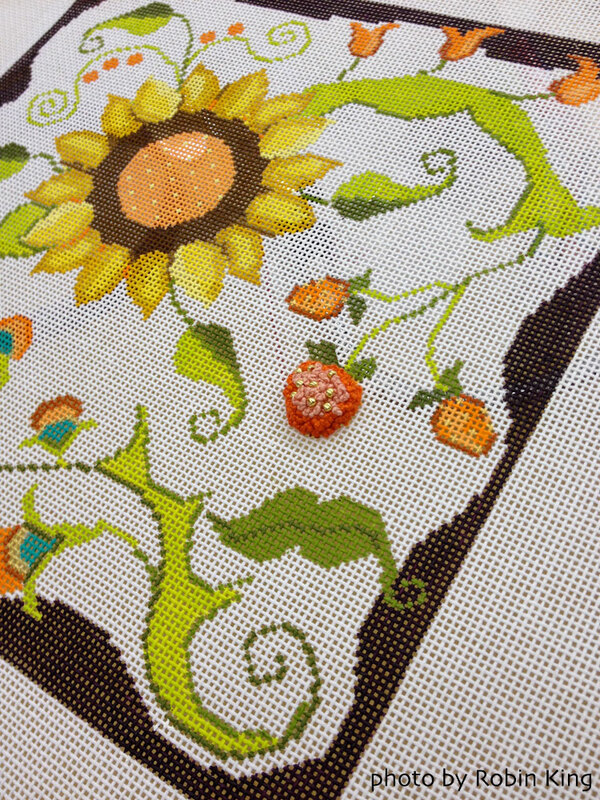 The morning session covered the Stumpwork portion of the canvas. Look at these Strawberries. Everyone did really good. What a success! Lunch was served back over at the shop and we ate outside under the shaded trees. I believe Lynn & Becky had even ordered the Chamber of Commerce Weather Package; it was 83 degrees with a gentle breeze. Purr-fect. The afternoon session focused on the rest of the stitch guide. Every detail was discussed. I believe I left them in good standing for what to do next. I traveled back home the next day... to Memphis. Home of BBQ, the Blues, Elvis and the HEAT. 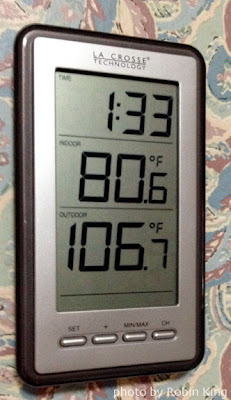 I know most of you are experiencing this heat, too. Crazy! Best take a cue from Leo... and stay cool. 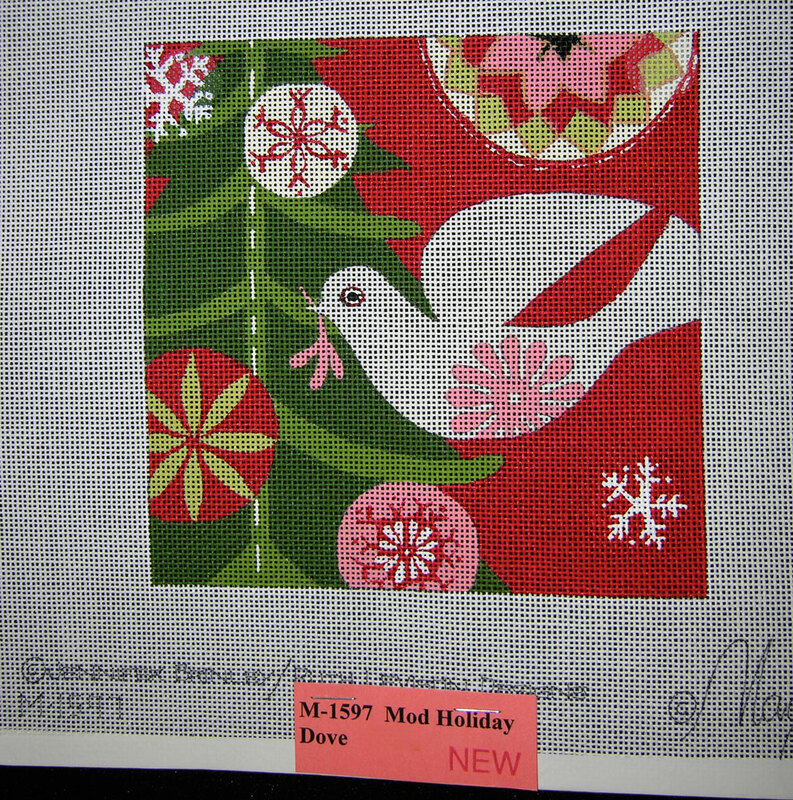 Labels: Leo, Needledeeva, Robin King, Sunflower and Berries (ND 309), What's the Point? What's The Point? Needlepoint in Dublin, OH. 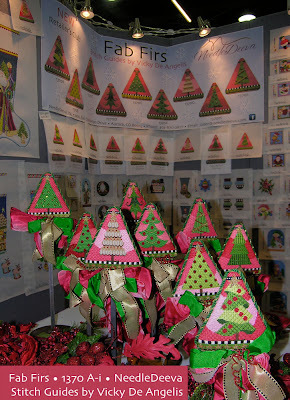 Fab Firs looked like all together. The 6-foot Fab Firs banner was a nice beacon to draw people towards them. 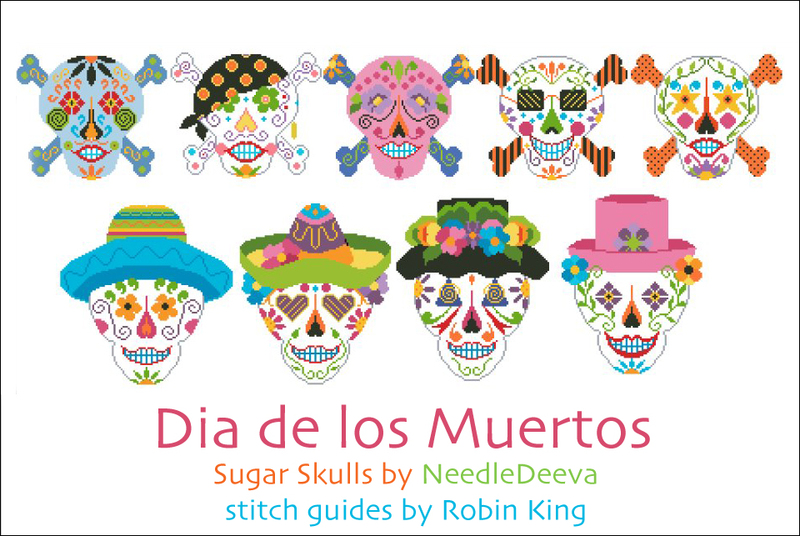 3 Cats and the Sugar Skulls that I am stitching (stitch guides available). 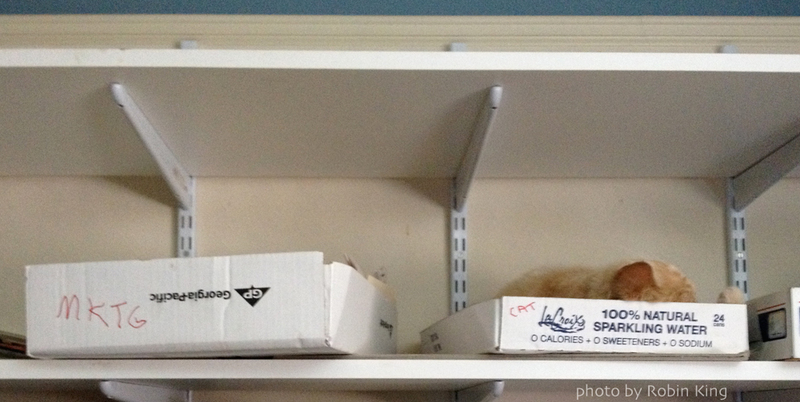 Can you guess which Skull goes with this preview? They are so much fun to stitch. Bring on the bling! I finally took the time to walk the floor and visit friends/designers. How exciting is it to call them by their first names... and, for them to know mine! Here are some of the new canvases which caught my eye at the Maggie Co / Ewe & Eye booths. I love anything mid-century modern so these really spoke to me. I really enjoyed seeing the artwork by Lisa Krause from Deuxbijouxbijoux. 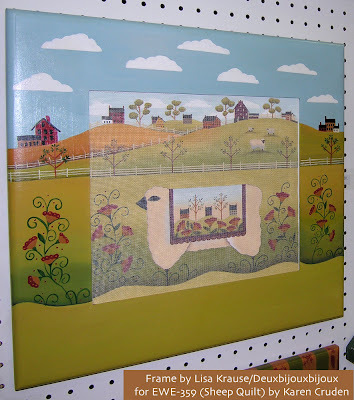 Lisa lives in Arkansas with her husband, Jim, and designs hand-painted frames to coordinate with the Maggie Co and Ewe & Eye canvases. 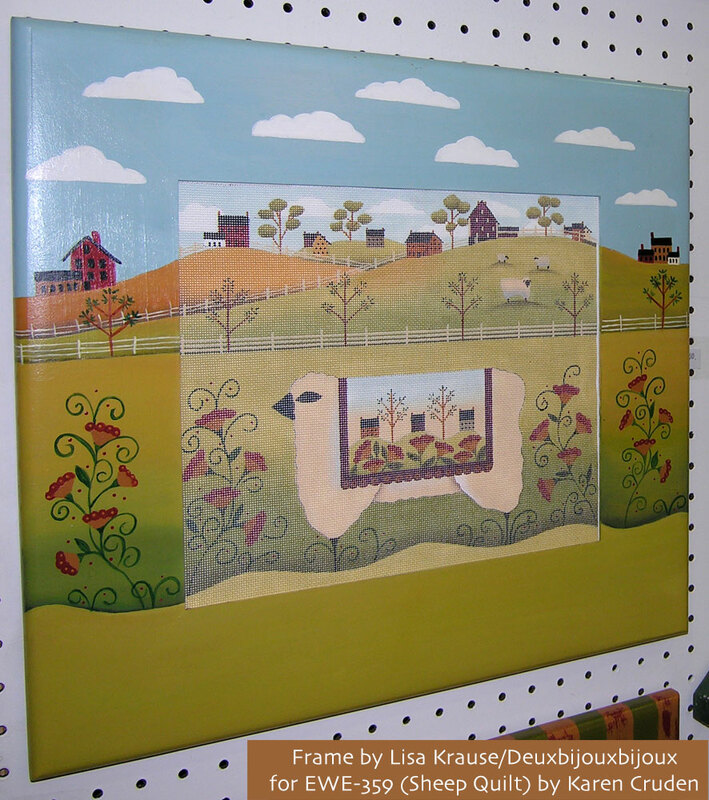 Just look at this frame for Sheep Quilt. I love it. 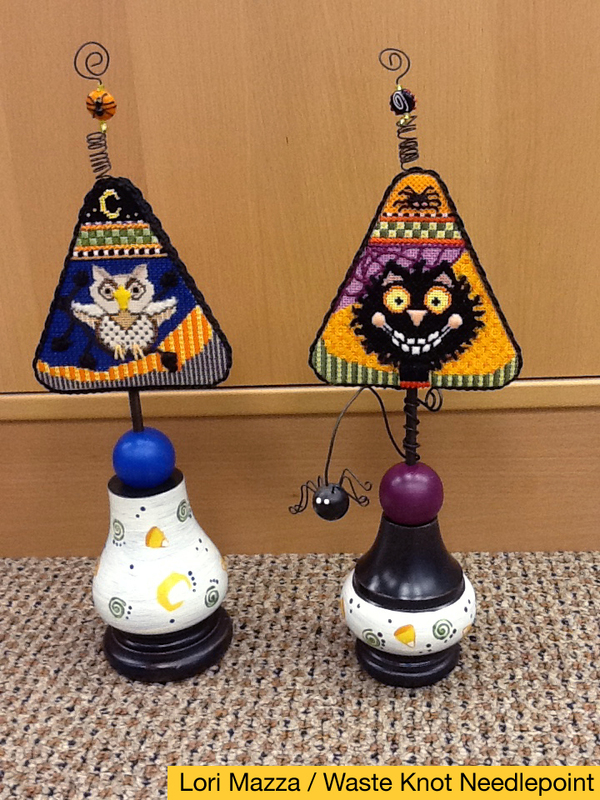 Your local needlepoint shop can order these. The class I taught at TNNA (Lotus Squared • ZE 134 by Zecca) for the shop owners was a success. Originally, I was told there were 10 who signed up... and then 14... and finally 15. How exciting to see all of their faces. Shop owners from Alabama, Ohio, Tennessee, Minnesota, Baltimore, Arizona, Indiana, Texas, Pittsburgh, and Hawaii were in attendance. One of those dry eraser boards was brought in for my demonstrations and illustrations. A picture is worth 1,000 words, right? 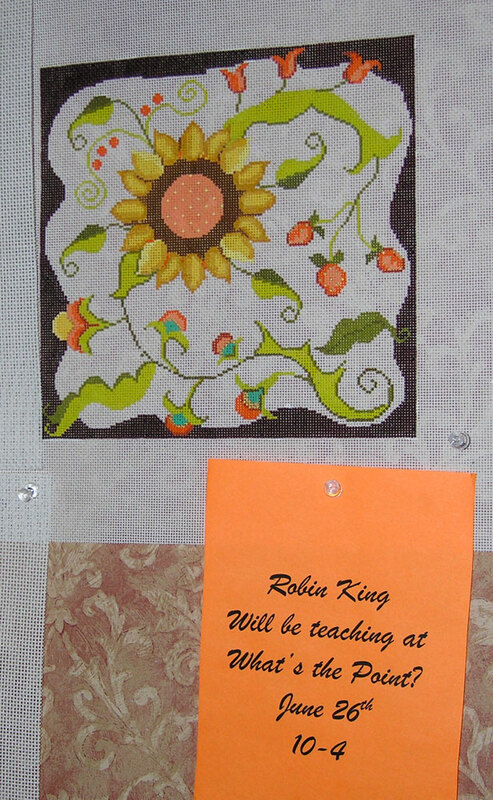 Early plans were also made with some designers and shop owners for future stitching and teaching events. I will keep you in the loop as those materialize. Perhaps you could join me? 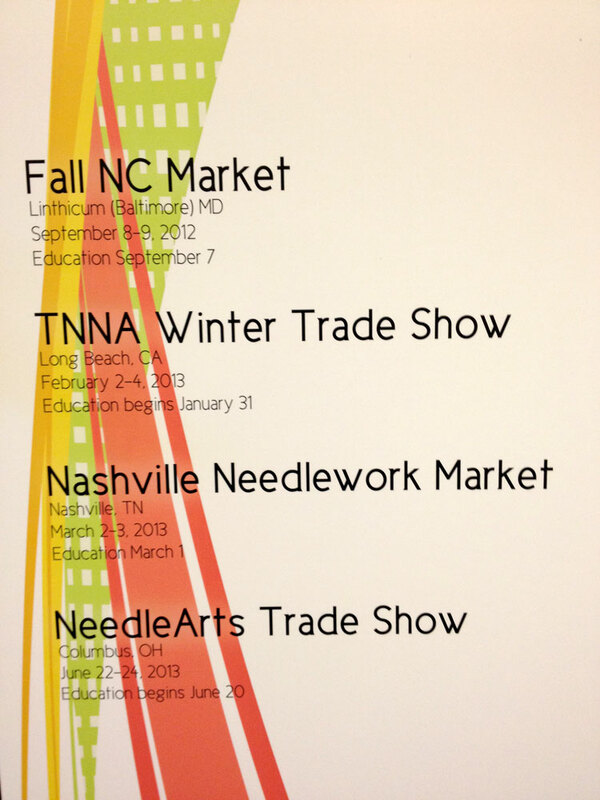 Here's the schedule for the next upcoming markets. Whew! 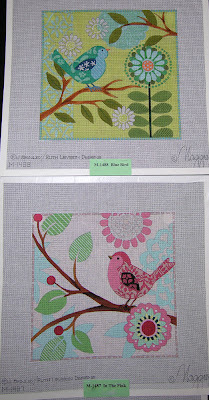 Who knew the needlepoint industry worked at such a fast pace? 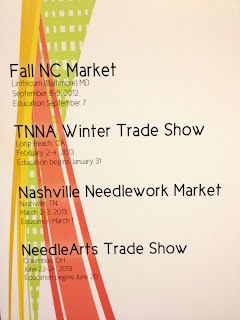 On Monday afternoon, the Market came to an end... and it was time to pack up the NeedleDeeva booth. 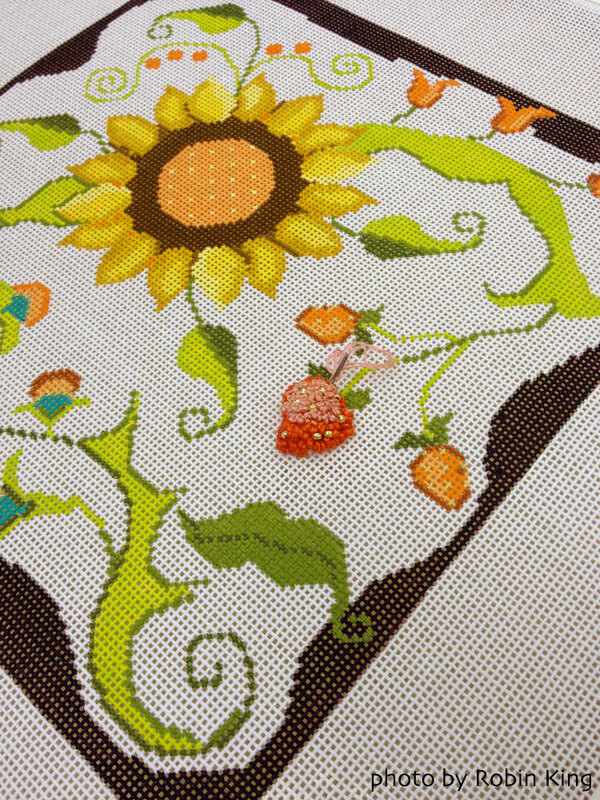 Soon after that, I was whisked away for my teaching of the Sunflower and Berries (ND 309) canvas at What's The Point? 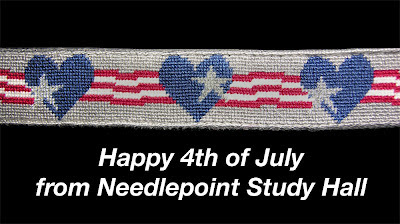 Needlepoint. 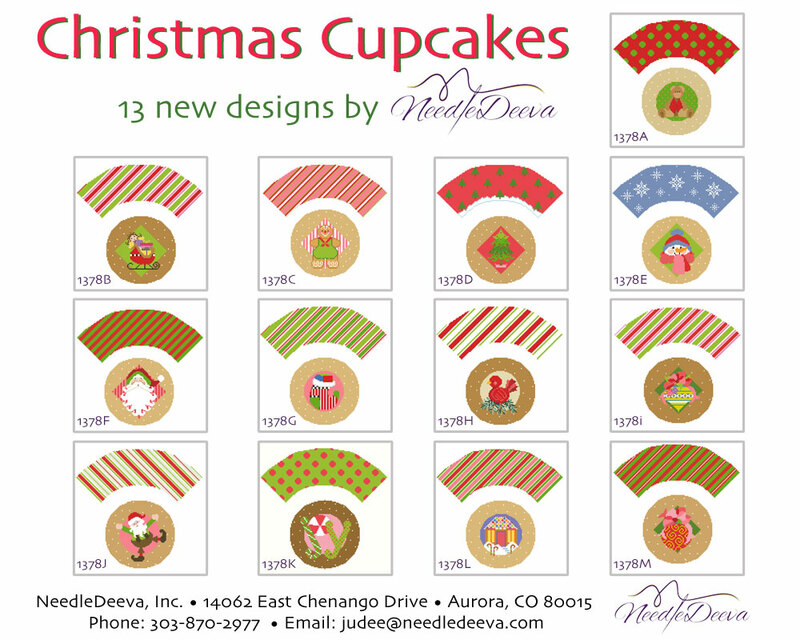 Labels: Ewe and Eye, Fab Firs, Lisa Krause, Lotus/Zecca ZE 134, Maggie Co, Needledeeva, Robin King, Sunflower and Berries (ND 309), What's the Point?